Yesterday was one of those unbelievable perfect spring days all-round. Sunny, with a few clouds building towards afternoon/evening leading us into today’s storm (rain where I am, but snow higher up). That just-right temperature between crisp and warm. I got up and fed the dogs at 6AM as usual, then made by way to the office to help with a highway clean-up event. If you’re going to pick up other people’s trash (btw, littering people are really disgusting creatures who apparently favor Keystone Light beer and plastic shopping bags), then the best way to do it is along a highway that runs right next to a wild and scenic river. Though that does lead to ‘adventure trashing’ due to the steep drop from the shoulder to the river’s edge. But hey, I was wearing a hard hat and a florescent yellow vest! And it was a nice break from my usual work routine. And then I went to work to go spend some time with some awesome people (I mostly mean my coworkers, but I had some cool visitor interactions too). Yesterday was my 6th work day in a row and finally my Friday. I was practically giddy for my three-day weekend by the time we closed the Visitor Center. But after the hour and half drive, it was about all I could do to stay awake through dinner (deep-dish beer bread pizza with some of the raw olives I ordered online recently) and part of the Planet Earth series that Craig and I have been watching. Now I’m on my weekend. I’ve had a ton of coffee, it’s raining outside which means all the animals are inside (and bored), and I’m already on internet overload for the day. Is it sad that I’m looking forward to getting back to not having internet? For me, probably not. Three days off, wrap up housesitting, and then I head to Portland on Sunday for a convention and, so NOAA tells me, more rain. In El Portal, driving towards the park after the highway clean-up. Cascades has lots of water right now. I don’t have many pictures of this waterfall because I pass it on my way to/from work and am either on the bus or don’t have enough time to stop and hang out. 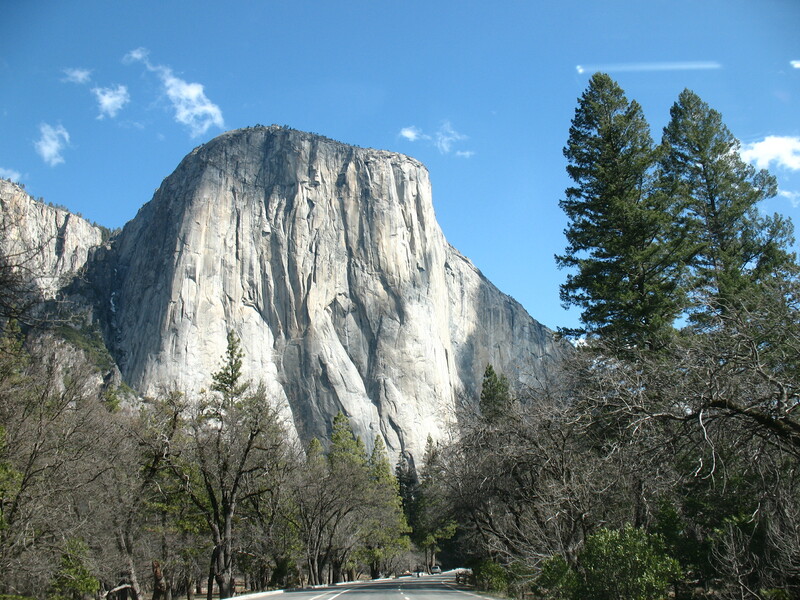 El Capitan from Southside Drive with the perfect blue sky behind. 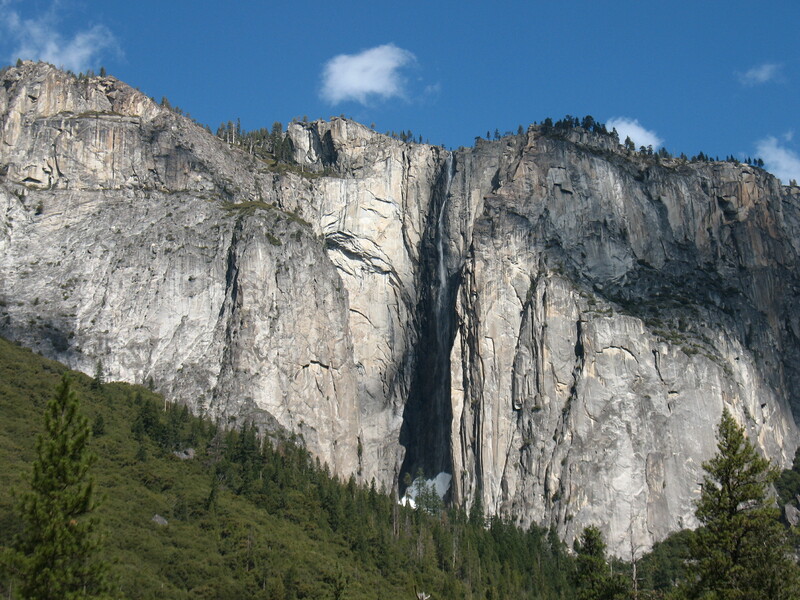 And Ribbon Fall that’s just west of El Capitan. 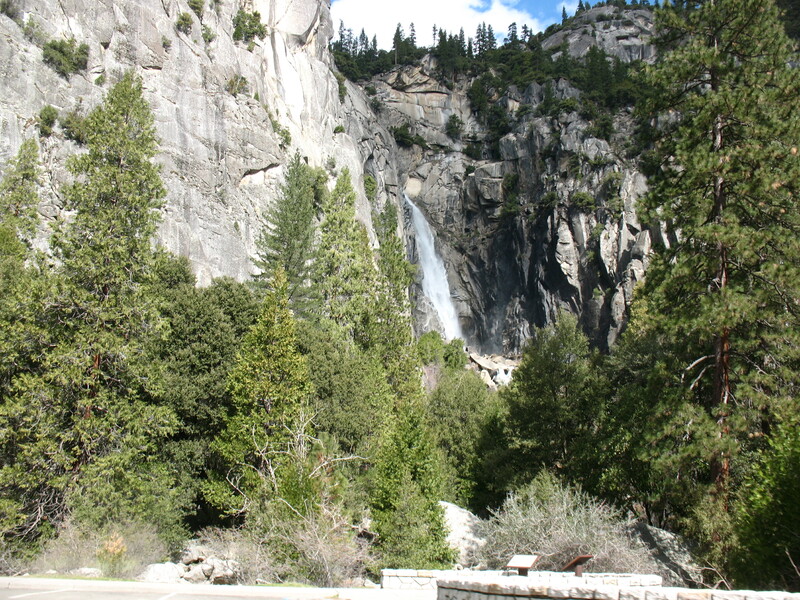 I’m looking forward to hiking up to the base of this waterfall once the snow melts out this spring. 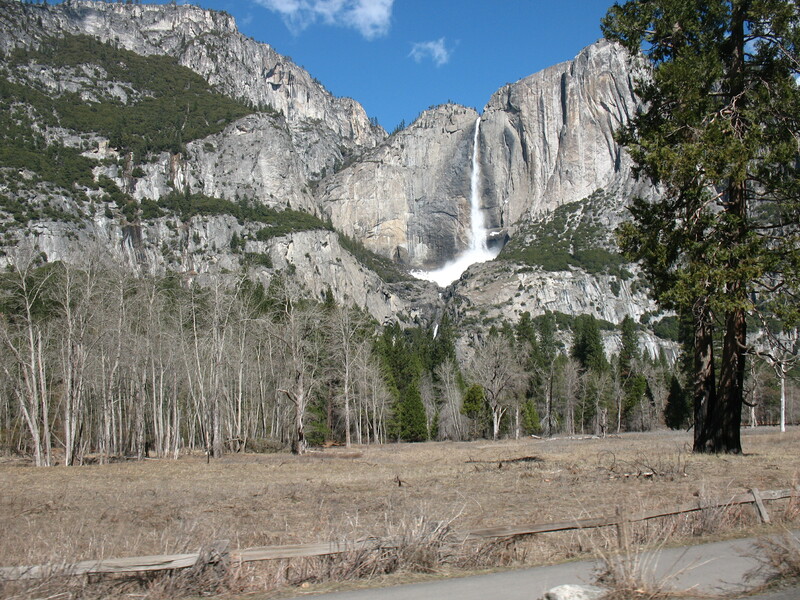 Yosemite Falls from across the meadow. There’s water galore right now even though we’ve dropped well below average for our snowpack for the year at this point (68-70% of average). Hopefully the storm we’re getting right now will bump us back up a bit. 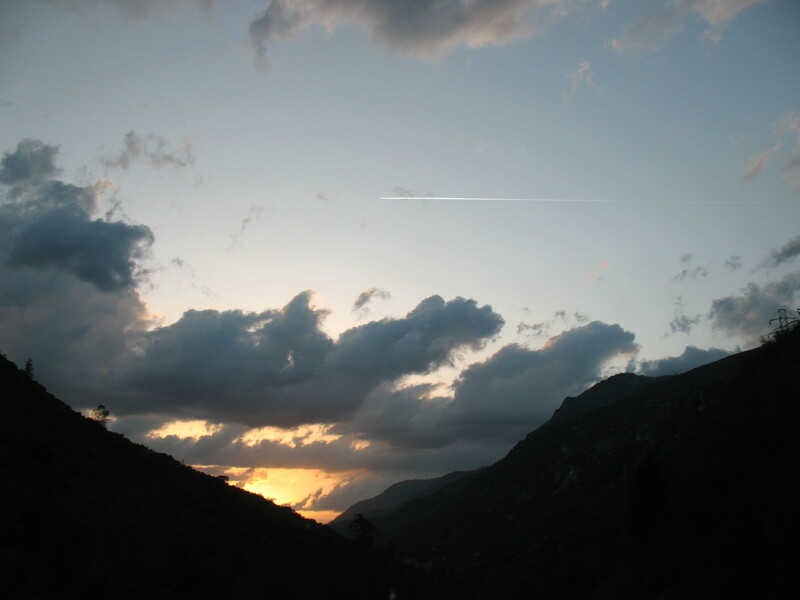 And here’s a sunset view while driving back down the river canyon yesterday evening. 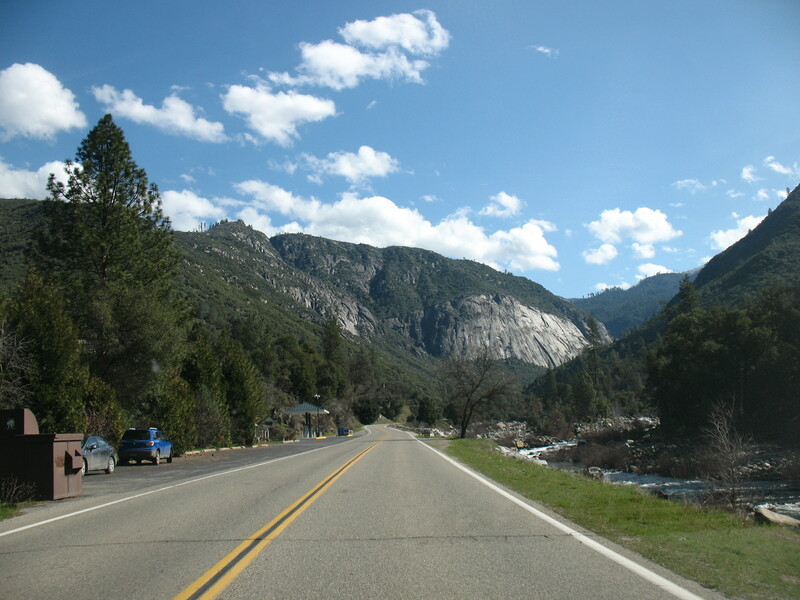 This entry was posted in Uncategorized and tagged cascades, el capitan, el portal, highway clean-up, housesitting, perfect day, portland, rain, ribbon fall, spring, three day weekend, yosemite falls. Bookmark the permalink.